This new and exciting learning experience allows teachers and program designers anywhere in the world to take a "Real Time" "One On One" video interactive program/curriculum consultation with Wayne Downey via the Internet. "CyberClinic" - Teachers and program designers can benefit incredibly by scheduling a private video interactive clinic with Wayne Downey at their own convenience. Price includes a full (1) one hour clinic. A customized clinic addressing your music program's "wants & needs". An interactive video evaluation of the strengths and weaknesses of your marching band show design. A rehearsal plan complete with suggested warm-ups and technique exercises for your symphonic and or marching band. "Killer Chords" one of Wayne's original tuning sequences for band free of charge. Answers to any pertinent questions the teacher might have concerning the development of his/her music program. 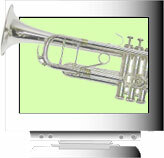 A customized clinic evaluating one of your most recent compositions or arrangements. Tips on key selection, orchestration, voicing, counterpoint and instrument ranges. An interactive video evaluation of the effectual and compositional depth of design. Answers to any pertinent questions the arranger might have concerning composing or arranging for marching band, drum corps, brass band, TV, cinema or stage and theater. Scheduling a CyberClinic "Is As Easy As 1-2-3"
Purchase this service by clicking "Add to Cart" and then checking out. Once purchased, Wayne will contact you to schedule a time that best fits your needs. Login to Skype at the agreed time for your clinic. Skype is a free program that allows you to video conference with Wayne for free. Download Skype. I have been doing CyberClinics with Mr. Downey for over 3 years. I am a percussion / drumline teacher with over 30+ years experience, but over the past 5 - 7 years, I have been writing for brass, which is quite different and much fun. You can expect a full analysis of your arrangement / composition from Mr. Downey, highlighting the positive as well as the areas for improvement. There is a lot that is covered in each session, so I would recommend taking detailed notes, both on your score as well as a black sheet. ( I hand write mine then type them up and save them later for future sessions). You will always, always learn something new in each session. Believe me when I say this is the best money an arranger / composer can spend, period. Having a private arranging lesson with the amazing Wayne Downey was definitely a dream come true. I have been a fan of his for many decades. I was a bit nervous, but Wayne immediately makes you feel comfortable. He takes the time to answer all of your questions, share his insights and suggestions. He also sent me some very good pdf files that give more techniques and ideas for writing. I came away from this one lesson feeling optimistic, confident, and extremely motivated to do more writing for both the concert and marching band genres. I look forward to my next lesson with him very soon. In conclusion, I highly recommend to all of my composing/arranging colleagues to consider taking a lesson with one of the best, Wayne R. Downey. Imagine admiring (for decades) the sound of the world-renown Blue Devils brass section. Now imagine sitting in the comfort of your own home having a private arranging lesson with Wayne Downey, the musical force behind that brass dynasty. The XtremeBrass CyberClinic made that possible for me today! I expected a lot and was not disappointed. In one lesson I received information that will immediately make my charts better. Wayne had studied my scores and immediately went to work sharing suggestions and techniques, both specific and general, about how to make my arrangements better. His years of experience at the forefront of the drum corps and marching band arenas have made him a teacher of unparalleled experience and excellence. Don't miss out on this opportunity to learn from a master!